Do you think it could be the diet? The map below is from The Robert Wood Johnson Foundation’s “The State of Obesity: 2015” report. 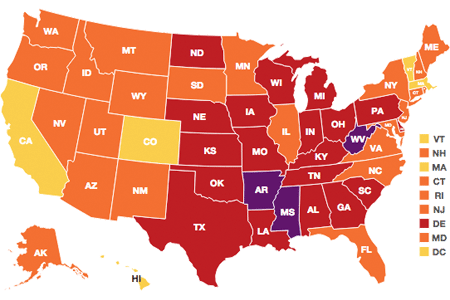 To make it short and sweet, only Colorado, California, Hawaii, Vermont, Massachusetts and the District of Columbia have obesity rates less than 25% in adults. Having listened to patients complain about their weight for 20 years, I know that it’s inevitable that someone is going to argue that they (or we) are fat because of our genes. That’s a load of crap. The CDC reports that the average weight for adults in the US increased at least 24 pounds between the early 1960’s and 2002. And it’s gone up since. So, with a few exceptions, your parents and grandparents were not as fat as you. Previous PostPrevious Why an apple for a favicon?